After graduation from the University of Konstanz in Germany with a M.Sci. 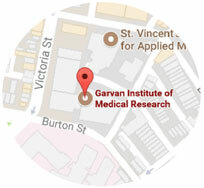 in Immunology, I moved to Sydney to embark on a PhD at the Centre for Vascular Research at UNSW. During my PhD I focused on unravelling the role of membrane order and lipid rafts during phagocytosis by macrophages. The PhD project involved advanced imaging techniques. Since the laboratory I was working in was a leader in the field of advanced microscopy methods, I decided to follow up the PhD with a post-doc position. During this time I contributed to the development and establishment of fluorescence based superresolution microscopy and used this technique to investigate the role of lipid membrane anchors in protein targeting to ordered domains in the cell membrane. I joined Paul Timpson’s group to apply advanced imaging techniques to the study of cancer invasion and metastasis. Erami, Z., Herrmann, D., Warren, S. C., Nobis, M., McGhee, E. J., Lucas, M. C., Leung, W., Reischmann, N., Mrowinska, A., Schwarz, J. P., Kadir, S., Conway, J. R., Vennin, C., Karim, S. A., Campbell, A. D., Gallego-Ortega, D., Magenau, A., Murphy, K. J., Ridgway, R. A., Law, A. M., Walters, S. N., Grey, S. T., Croucher, D. R., Zhang, L., Herzog, H., Hardeman, E. C., Gunning, P. W., Ormandy, C. J., Evans, T. R., Strathdee, D., Sansom, O. J., Morton, J. P., Anderson, K. I., and Timpson, P. (2016) Intravital FRAP Imaging using an E-cadherin-GFP Mouse Reveals Disease- and Drug-Dependent Dynamic Regulation of Cell-Cell Junctions in Live Tissue, Cell reports 14, 152-167. Alvarez-Guaita, A., Vila de Muga, S., Owen, D. M., Williamson, D., Magenau, A., Garcia-Melero, A., Reverter, M., Hoque, M., Cairns, R., Cornely, R., Tebar, F., Grewal, T., Gaus, K., Ayala-Sanmartin, J., Enrich, C., and Rentero, C. (2015) Evidence for annexin A6-dependent plasma membrane remodelling of lipid domains, British journal of pharmacology 172, 1677-1690. Gallego-Ortega, D., Ledger, A., Roden, D. L., Law, A. M., Magenau, A., Kikhtyak, Z., Cho, C., Allerdice, S. L., Lee, H. J., Valdes-Mora, F., Herrmann, D., Salomon, R., Young, A. I., Lee, B. Y., Sergio, C. M., Kaplan, W., Piggin, C., Conway, J. R., Rabinovich, B., Millar, E. K., Oakes, S. R., Chtanova, T., Swarbrick, A., Naylor, M. J., O'Toole, S., Green, A. R., Timpson, P., Gee, J. M., Ellis, I. O., Clark, S. J., and Ormandy, C. J. (2015) ELF5 Drives Lung Metastasis in Luminal Breast Cancer through Recruitment of Gr1+ CD11b+ Myeloid-Derived Suppressor Cells, PLoS biology 13, e1002330. Huo, C. W., Chew, G., Hill, P., Huang, D., Ingman, W., Hodson, L., Brown, K. A., Magenau, A., Allam, A. H., McGhee, E., Timpson, P., Henderson, M. A., Thompson, E. W., and Britt, K. (2015) High mammographic density is associated with an increase in stromal collagen and immune cells within the mammary epithelium, Breast cancer research : BCR 17, 79. Kular, J., Scheer, K. G., Pyne, N. T., Allam, A. H., Pollard, A. N., Magenau, A., Wright, R. L., Kolesnikoff, N., Moretti, P. A., Wullkopf, L., Stomski, F. C., Cowin, A. J., Woodcock, J. M., Grimbaldeston, M. A., Pitson, S. M., Timpson, P., Ramshaw, H. S., Lopez, A. F., and Samuel, M. S. (2015) A Negative Regulatory Mechanism Involving 14-3-3zeta Limits Signaling Downstream of ROCK to Regulate Tissue Stiffness in Epidermal Homeostasis, Developmental cell 35, 759-774. Magenau, A., and Gaus, K. (2015) 3D super-resolution imaging by localization microscopy, Methods in molecular biology 1232, 123-136. Magenau, A., Owen, D. M., Yamamoto, Y., Tran, J., Kwiatek, J. M., Parton, R. G., and Gaus, K. (2015) Discreet and distinct clustering of five model membrane proteins revealed by single molecule localization microscopy, Molecular membrane biology 32, 11-18. Magenau, A. J., Saurabh, S., Andreko, S. K., Telmer, C. A., Schmidt, B. F., Waggoner, A. S., and Bruchez, M. P. (2015) Genetically targeted fluorogenic macromolecules for subcellular imaging and cellular perturbation, Biomaterials 66, 1-8. Herrmann, D., Conway, J. R., Vennin, C., Magenau, A., Hughes, W. E., Morton, J. P., and Timpson, P. (2014) Three-dimensional cancer models mimic cell-matrix interactions in the tumour microenvironment, Carcinogenesis 35, 1671-1679. Nobis, M., McGhee, E. J., Herrmann, D., Magenau, A., Morton, J. P., Anderson, K. I., and Timpson, P. (2014) Monitoring the dynamics of Src activity in response to anti-invasive dasatinib treatment at a subcellular level using dual intravital imaging, Cell adhesion & migration 8, 478-486. Cheng, X., Lowe, S. B., Ciampi, S., Magenau, A., Gaus, K., Reece, P. J., and Gooding, J. J. (2014) Versatile "click chemistry" approach to functionalizing silicon quantum dots: applications toward fluorescent cellular imaging, Langmuir : the ACS journal of surfaces and colloids 30, 5209-5216. Gambin, Y., Ariotti, N., McMahon, K. A., Bastiani, M., Sierecki, E., Kovtun, O., Polinkovsky, M. E., Magenau, A., Jung, W., Okano, S., Zhou, Y., Leneva, N., Mureev, S., Johnston, W., Gaus, K., Hancock, J. F., Collins, B. M., Alexandrov, K., and Parton, R. G. (2014) Single-molecule analysis reveals self assembly and nanoscale segregation of two distinct cavin subcomplexes on caveolae, eLife 3, e01434. Guan, B., Magenau, A., Ciampi, S., Gaus, K., Reece, P. J., and Gooding, J. J. (2014) Antibody modified porous silicon microparticles for the selective capture of cells, Bioconjugate chemistry 25, 1282-1289. Chockalingam, M., Magenau, A., Parker, S. G., Parviz, M., Vivekchand, S. R., Gaus, K., and Gooding, J. J. (2014) Biointerfaces on indium-tin oxide prepared from organophosphonic acid self-assembled monolayers, Langmuir : the ACS journal of surfaces and colloids 30, 8509-8515. Owen DM, Magenau A, Williamson DJ, Gaus K. Super-resolution imaging by localization microscopy. Methods Mol Biol. 2013; 950:81-93. Owen DM, Williamson DJ, Boelen L, Magenau A, Rossy J, Gaus K. Quantitative analysis of three-dimensional fluorescence localization microscopy data. Biophys J. 2013; 105(2):L05-7. Ngalim SH, Magenau A, Zhu Y, Fairjones Z, Gooding JJ, Böcking T, Gaus K. Creating adhesive and soluble gradients for imaging cell migration with fluorescence microscopy. J Vis Exp. 2013; (74). doi: 10.3791/50310. Owen DM, Williamson DJ, Magenau A, Gaus K. Sub-resolution lipid domains exist in the plasma membrane and regulate protein diffusion and distribution. Nat Commun. 2012; 3:1256. Magenau A., Owen DM, Benda A., Williamson DJ, Kross A., Gaus K. Novel microscopy techniques shed light onto lipid raft biology. Annual Reviews in Fluorescence Microscopy 2011. Ng CCA, Magenau A, Ngalim SH, Ciampi S, Chockalingham M, Harper JB, Gaus K, Gooding JJ. Using Electrical Potential to Reversibly Switch Surfaces between Two States for Dynamically Controlling Cell Adhesion. Angewandte Chemie 2012; 51:7706-7710. Owen DM, Williamson D, Magenau A, Gaus K. Optical techniques for imaging membrane domains in live cells (live-cell palm of protein clustering). Methods Enzymology 2012; 504:221-35. Williamson, D, Magenau A, Owen DM, Gaus, K. Biological Fluorescence Nanoscopy. SRM Biophotonics 2012. Owen DM, Magenau, A, Williamson D, Gaus K. The lipid raft hypothesis revisited – New insights on raft composition and function from super-resolution fluorescence microscopy. BioEssays 2012; 34(9):739-47. Owen DM, Rentero C, Magenau A, Abu-Siniyeh, Gaus K. Quantitative imaging of membrane lipid order in cells and organisms. Nature Protocols 2011; 7(1):24-35. Magenau A, Benzing C, Proschogo N, Don AS, Hejazi L, Karunakran D, Jessup W, Gaus K. Phagocytosis of IgG-Coated Polystyrene Beads by Macrophages Induces and Requires High Membrane Order. Traffic 2011; 12(12):1730-1743. Le Saux G, Magenau A, Gunaratnam K, Kilian KA, Böcking T, Gooding JJ, Gaus K. Spacing of integrin ligands influences signal transduction in endothelial cells. Biophys J 2011; 101(4):764-763. Le Saux G, Magenau A, Böcking T, Gaus K, Gooding JJ. The relative importance of topography and RGD ligand density for endothelial cell adhesion. PLoS ONE 2011; 6(7):e21869. Williamson DJ, Owen DM, Rossy J, Magenau A, Wehrmann M, Gooding JJ, Gaus K. Pre-existing clusters of the adaptor Lat do not participate in early T cell signaling events. Nature Immunology 2011; 12(7):655-62. Owen, DM, Magenau, A, Majumbar, A & Gaus, K. Imaging Membrane Lipid Order in Whole, Living Vertebrate Organisms. Biophysical Journal 2010; 99:L7-L9. Guan B, Magenau A, Kilian KA, Ciampi S, Gaus K, Reece PJ , Gooding JJ. Mesoporous silicon photonic crystal microparticles: towards single-cell optical biosensors. Faraday Discuss 2011; 149:301–317. Zhu X, Gaus K, Lu Y, Magenau A, Truscott R.J.W., Mitchell T.W. a- and b-Crystallins Modulate the Head Group Order of Human Lens Membranes during Aging. Investigative Ophthalmology and Visual Science 2010; 51(10):5162-7. Ngalim SH, Magenau A, Le Saux G, Gooding JJ, Gaus K. How do cells make decisions: engineering micro- and nano-environments for cell migration. J Oncol 2010; 2010:363106. D. Owen D, Rentero C, Rossy J, Magenau A, Williamson D, Rodriguez M and Gaus K. PALM microscopy and cluster analysis of protein heterogeneity at the cell surface. Journal of Biophotonics 2010; 3(7):446-54. Rajendran L, Beckmann J, Magenau A, Boneberg E-M, Gaus K, Viola A, Giebel B, Illges H. Flotillins Are Involved in the Polarization of Primitive and Mature Hematopoietic Cells. PLos One 2009; 4(12): e8290. Kilian KA, Magenau A, Böcking T, Gaus K, Gal M, Gooding JJ. Silicon-based mesoporous photonic crystals: towards single cell optical biosensors. Proc. of SPIE 2009; 7397:739703. Magenau A, Rentero C, Gaus K. Membrane Organization, Fluorescence Applications In Biotechnology and Life Sciences, Chapter 16, FABLS 2009. Rentero C, Magenau A, Williamson D, Tedla N, Gaus K. Membrane domains as signaling centers in macrophages and T-cells: from concepts to experiments. Immun Endoc & Metab Agents in Med Chem. 2009; 8:336-348. Kilian KA, Lai LM, Magenau A, Cartland S, Böcking T, Di Girolamo N, Gal M, Gaus K, Gooding JJ. Smart tissue culture: in situ monitoring of the activity of protease enzymes secreted from live cells using nanostructured photonic crystals. Nano Lett. 2009; 9(5):2021-5.